Mitsubishi Mirage Cyborg - J's Garage Export Co., Ltd.
Mitsubishi Mirage Cyborg is a 2-door front-wheel-drive hatchback with a high-performance 4G92 engine. 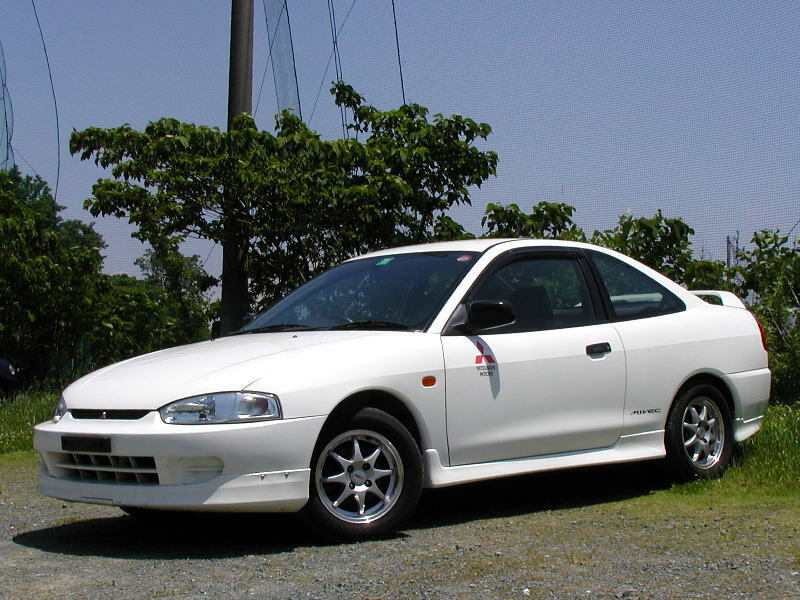 The Mitsubishi Mirage Cyborg is powered by a 4G92 1.6-liter l-4 DOHC MIVEC(MIVEC is Mitsubishi's variable valve timing and electronic valve lift control system.) engine that makes 175 horsepower and revs to nearly 8200rpm. And the Mirage Cyborg also adopt hard suspension, larger wheels, and tires to improve handling. 1995 Mirage Cyborg-ZR Main Equipment : Power window, Keyless entry unlock, Electric colored door mirrors, Power steering, Auto air conditioning, Rear roof spoiler, Center door lock, Front fog lamp, High mounted stop lamp, Sports 5-speed transmission, 195/55R15 tires, Driver SRS air-bag, Front RECARO seats, MOMO steering wheel, White meter, Alloy wheels. 1999 Mirage Cyborg-ZR Main Equipment : Power window, Keyless entry unlock, Electric colored door mirrors, Power steering, Auto air conditioning, Rear roof spoiler, ABS, Center door lock, Front fog lamp, High mounted stop lamp, Sports 5-speed transmission, 195/55R15 tires, Driver SRS air-bag, Front RECARO seats, MOMO steering wheel, White meter, 15-inches Alloy wheels.